First off, I should warn you that I am not a big drinker. I don't drink very often and when I do I often end up acting like a big baby because I almost always get a headache. I don't get the whole whiskey/Scotch snob thing though I enjoy a shot of Irish now and then (I'll never forget how warmed I was by a shot of Tullamore Dew Aideen gave me after I came in from a soaking afternoon in her cow fields, so I always have a bottle of Irish on hand). I've never liked vodka, and if I drink a martini I want it to be dirty and made with gin. I do love gin, probably not all that surprising from a guy who put 'Juniper' on his daughter's birth certificate (though the story of her name has nothing to do with such spirits). A Dutchman is credited with the invention of gin, so it's appropriate that a brewery/distillery in my wife's home town of Holland, Michigan is making it's own small batches of gin (not priced too shabbily either, at $25 a 750ml bottle). I picked up a bottle the other day and hopefully without sounding like too much of a douche, I can say it is surprisingly flavorful and much more interesting than your typical imported dry gin. 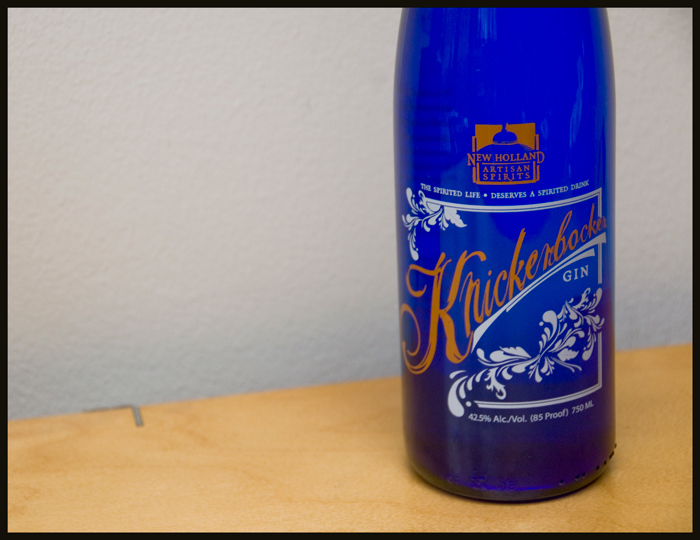 I am really looking forward to trying Anchor Steam's Junipero gin next time we get out to California. Now there's a bottle my daughter is one day totally going to display with prominence on her college mantle.